I’ve been eating pretty clean for a while now (see my post about how I managed to start eating whole foods despite my love of wine and chocolate here!) but like I’ve mentioned, I aim for an 80% clean goal. Most of the time I do way better than that but having that goal gives me permission to indulge when the mood strikes without beating myself up or feeling guilty. 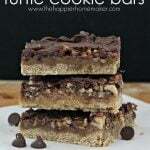 I recently made these butter pecan turtle cookie bars and let me tell you-they were 100% worth the indulgence!! With a sweet cookie crust, crunchy pecan layer and caramel toffee topped by chocolate this is one dessert you’ll make again and again! 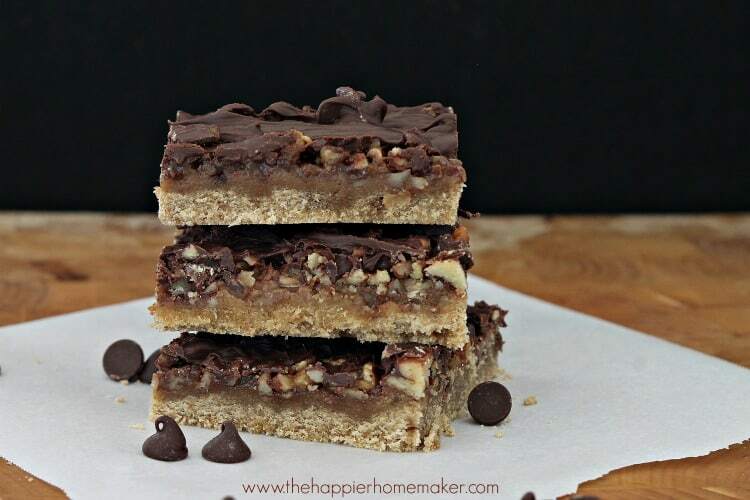 These cookie bars are a delicious blend of pecans, toffee, and chocolate on a cookie crust! In a stand mixer combine the first three ingredients until well blended. Press mixture into the bottom of an ungreased 9 by 13 inch baking dish. In a small saucepan combine 2/3 cup butter and 1/2 cup brown sugar and heat to a boil over medium high heat, stirring constantly. Continue to boil for 3 minutes continuing to stir. Remove from heat and pour over crust and pecans. Bake for 17 minutes or until bubbling and golden. Remove from oven and top with chocolate chips. Allow to sit for 3 minutes then use the back of a spoon to spread melted chocolate. Recipe adapted from a super old Southern Living Magazine clipping! Oh my goodness. Now you have given me one more way to love pecans! 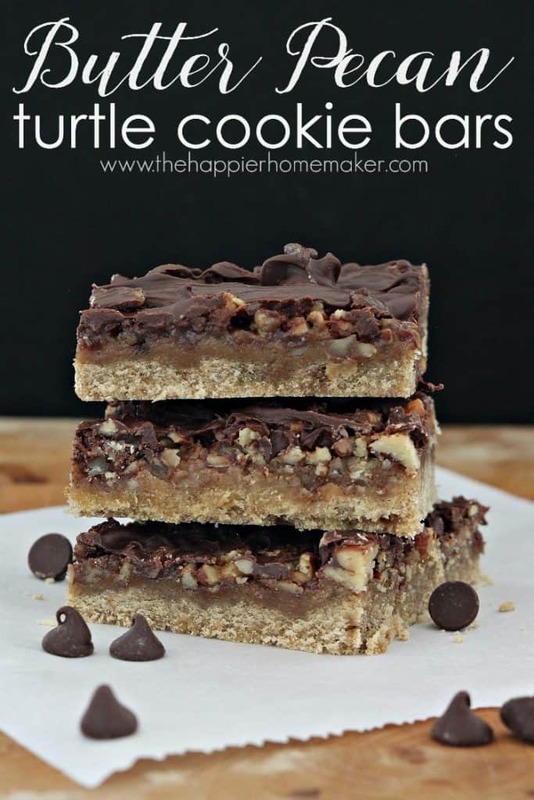 Absolutely gorgeous bars Melissa, and now I am CRAVING them….time to dust off my super hero cape and make these ASAP!!! Thanks for the great inspiration! Oh my goodness, these bars. They are insanely amazing! Pinning! Oh wow these look so amazing! I’m definitely going to try these soon!!! Oh my goodness! These look amazing. Thanks so much for sharing the recipe.